12 Easy Tricks-How To Keep Your Indoor Plants Healthy! Keeping plants is not everyone’s cup of tea. Some people like to do it and they have mastered it, whereas some are struggling with their wish to become great gardeners, but their plants just die eventually. How many people have you known that are just bad at keeping their plants alive? Let’s not feel sorry for them, but help them become masters in no time and with little effort. The benefits of keeping plants at home are numerous. They clean the indoor air, lighten up the room, and add to the decoration part of any home. Despite common knowledge, plants are easy to handle, but you just need to know a few tips in terms of maintenance. Plants have basic needs and they need to be well-taken care of. The right temperature is a very important factor for your houseplants. Most of the plants you keep at home don’t like dryness as well as extreme warmth. What they like is moist and cooler temperatures. It is useful to have a thermostat so that you can change the room temperature. It is best to lower it for 10 degrees. 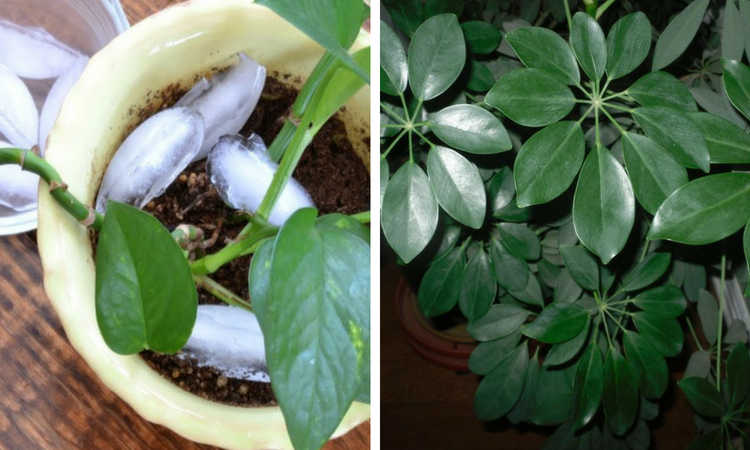 Although it may seem odd to you, ice cubes are a great option for watering your plants. It is important to put the cubes around, and not touching the stem. Your plants will be watered with the ice melting process. This is a great way to freshen up your plants’ leaves. Yes, it is safe to use it on your plants. You just need to apply a small amount of mayonnaise using a paper towel and the leaves with become shiny and bright in no time. This will go on for weeks. Instead of mayonnaise, you can also use a 50-50 mixture of milk and warm water. Apply with a soft cloth and enjoy your shiny leaves. In order to keep your furniture and floor undamaged, it is best to use old mouse pads underneath your plant containers. You will end up with a clean floor and a nice decoration. Coffee is a plant’s best friend as well. If you happen to have some leftover coffee, add an equal amount of water to it and pour it to your plant, the acid-lover. Coffee can replace the regular act of watering. We are still connected to the coffee subject. This time we are going to help you in maintaining your plants with coffee filters. It is the cheapest way to maintain your plants and keep them clean. What you need to do is put a filter on the base of the pot right before filling it with compost. In this way, the compost won’t go all over the pot, like it usually happens with most plants. The water you use every day when cooking or washing up can be used to water the plants or anywhere in your personal garden. It is completely safe and ecological. So, when you cook pasta, rice, or vegetables, use the leftover water for your plants (not salted). When using dish-washing water, use it if it is with a plant-based detergent. Don’t use water previously used for cooking meat. This is an interesting way to keep your plants happy on a daily basis. It is very beneficial because your breath’s carbon dioxide will energize the gas exchange cycles that happen in the plant. Also, you will need a well-lit room to read the newspaper, so it is a great way to expose your plants to extra light that helps them grow. Some plants are particularly easy to maintain and you don’t need a gardener’s experience to keep them alive. For instance, such plants include jade, the spider plant, Aloe Vera, and ponytail palm. These are not going to die if you forget about them for some period of time. So, if you happen to lack a green thumb, choose one of the above-mentioned plants or research for more to find plants that are easy to maintain. Garlic can kick away all bugs that are trying to attack your plant. You just need one clove of garlic per a houseplant and all the pests will be gone for good. You can use garlic as an insect-repellent inside and outside (in your garden) as well. If the garlic happens to sprout, just cut it back. Important note: Re-potting is very important for your houseplants. Winter time is not a great time to be doing this, because as you know, winter is the season when plants are resting. The plants will not grow well because of the lack of light and other conditions. When re-potting, make sure you choose the right size of the pot. Look for a size no more that 2’’ or larger than the existing pot. If you love to decorate the pottery, you can pot the plants in cheap plastic pots, because those can be moved from container to container without disrupting the roots. South-facing windows get more light than north-facing ones. If your windows are facing east or west, you need to observe to see how much light there is so that you can decide which plants to put there. If your plants have bright foliage, they need more light than normal. You may also need to half-turn the pot on a daily basis to keep the plant’s growth even. Also, if the sun is too intense during the summer, make sure you move the plant away during the hot period.